An early-stage medtech venture developing a new microneedle platform technology has won a University College Dublin (UCD) commercialisation award. 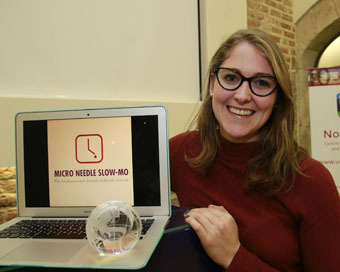 The creator of Micro Needle Slow-Mo is Ellen Cahill, a PhD student in the UCD Medical Device Design Group within the UCD School of Mechanical and Materials Engineering. Ellen is working on this start-up technology with Dr Eoin O’Cearbhaill and Dr Shane Keaveney. Microneedle patches are microsystem devices which are commonly used to painlessly pierce an individual’s skin creating a pathway for therapeutic drug delivery. Many such needles have been designed for use in vaccine and therapeutic drug delivery. However there is an industry demand for biofunctional or stimulus responsive microneedles which can deliver a slow, sustained release of therapeutic drugs through a cost-effective, scalable process. To solve this issue Micro Needle Slow-Mo has designed and developed a new type of microneedle. This new microneedle platform technology has the potential to deliver slow-release therapeutics with enhanced mechanical performance compared to currently available microneedles on the market. Micro Needle Slow-Mo was the overall winner of the 2016 UCD MedTech Innovation Sprint Programme, a 1-day initiative designed and delivered by UCD’s technology transfer and enterprise development teams at NovaUCD. Each 1-day innovation sprint programme aims to encourage the development of commercial outputs, arising from specific research areas, by engaging with researchers at an earlier stage in the commercialisation process. This research has been supported by Science Foundation Ireland through a Technology Innovation Development Award, the Naughton Foundation and a Marie Skłodowska-Curie fellowship. NovaUCD is the hub for new ventures and entrepreneurs at University College Dublin, which nurtures and supports new high-tech and knowledge-intensive companies as part of UCD’s mission. You can find out more here.